What is it about dads that makes people cry? Regret about words unsaid to a dad now dead, issues unresolved, or just the general poignancy of the role of fathers, who are expected to be strong but not domineering, caring but not soft, and whose approval or disapproval can launch a child into a lifetime of success or a spiral of despair? White is a Buddhist, animal rights activist, and a writer of films that are philosophical but eminently relatable. His films, in which he often acts, usually focus on women protagonists wrestling with moral and spiritual issues, or flailing against a culture that does not accommodate their ideals. His superb HBO series “Enlightened” starred Laura Dern as an executive who has an emotional breakdown, has a spiritual awakening in rehab, then tries to make a comeback at her former company, where her newfound values clash with the corporate ethos. YEAR OF THE DOG (2007) was about a woman's growing commitment, amid the falling apart of her life, to animal rights. This year's BEATRIZ AT DINNER, written by White and directed by frequent collaborator Miguel Arteta, dramatized a confrontation between an idealistic vegan massage therapist (Salma Hayek) and a big-game-hunting real estate tycoon played by John Lithgow. Much of BRAD'S STATUS is an interior monologue by Brad as he compares himself unfavorably to his very successful classmates from Tufts. The Tufts gang's diaspora includes Nick Pascale (played by White in amusing silent segments), a Hollywood director with a hot husband and a house featured in Architectural Digest; Billy Whearsilter (Jermaine Clement), who sold his tech company and bought a Hawaiian island, where he cavorts with two beautiful “wahine”; Jason Hatfield (Luke Wilson), a super-rich hedge fund manager with a private plane; and Craig Fisher (Michael Sheen), a Washington pundit who writes best-selling books and is recognized by all from his frequent television appearances. 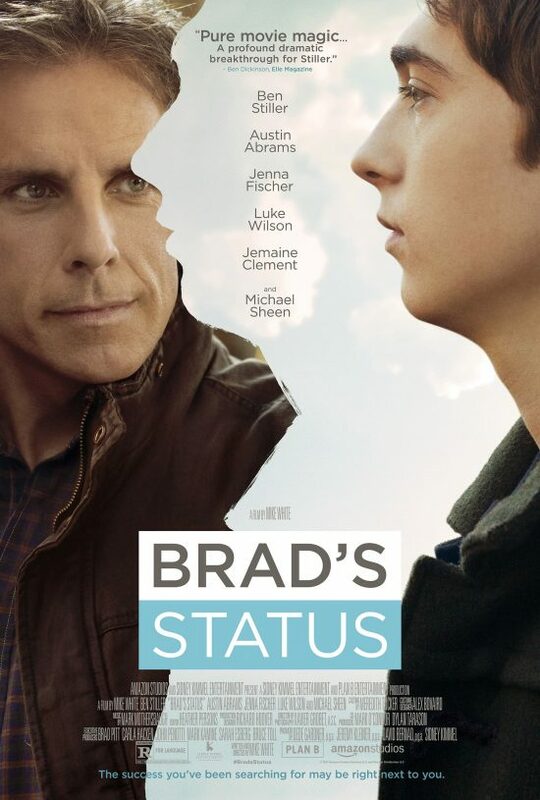 Brad knows he can be proud of his son, Troy, a smart teen who's also a talented pianist and composer. But as father and son travel to Boston for Troy's interviews at Harvard and Tufts, Brad also has to contend with feelings of envy toward Troy, whose achievements are likely to surpass his. It seems Brad was waitlisted, then rejected, by Harvard before landing at Tufts, the wanna-be Ivy. White's scripts demonstrate deep empathy for everyone, including his own father, who took him to tour East Coast schools and sacrificed to help launch him on a successful career path (hence his teary moment on “Fresh Air”). When Troy gets the day wrong and misses his Harvard interview, Brad pulls strings — to Troy's cringing embarrassment — to get him another interview. The string is a call to his friend-turned-nemesis Craig, who's a visiting professor at Harvard. His achievement impresses Troy and gives Brad a moment of fatherly triumph. Why, Ananya asked, is he competing with anyone? Brad has an epiphany while dining with Craig, the condescending but nominally friendly former classmate. As Craig spouts gossip about members of their group, Brad realizes that maybe other people's lives aren't quite as sparkly as they seem. Maybe things are just as they are meant to be.